First big change was fitting my new X/Z axis parts. 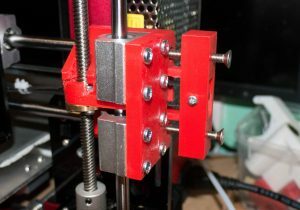 The new X-axis drive end. The X belt tensioner. A pair of M5 bolts. 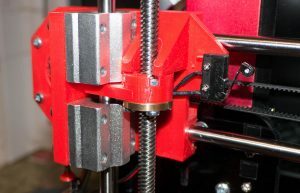 Now he belt is nice and tight but not putting side loads on the Z-axis rods or lead screws. And no more tension on the right hand end due to the warped original X axis support block. So now I have a printer that doesn’t need the Z-axis leadscrews adjusting EVERY print. 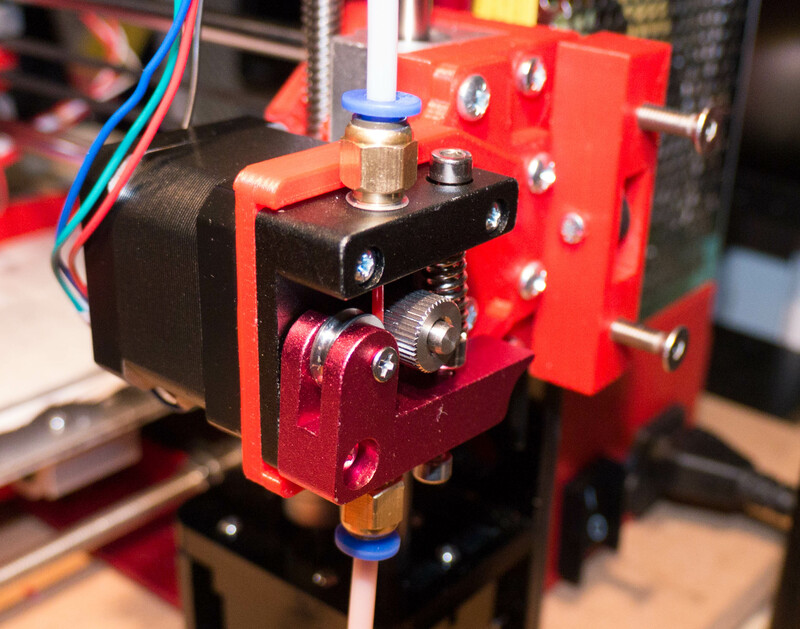 Next job, new hot end and extruder! 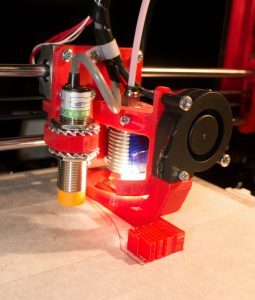 So I cheated horribly and picked up an bowden feed clone E3D V6 hotend from Aliexpress. I’d seen some good reviews and to be honest, this whole project is about taking punts with cheap stuff. Added to that was a clone Mk8 extruder and a capacitive bed sensor for auto levelling. Contrary to popular mythology the sensor needs 12v. It does have an open collector output so it can be wired directly to the existing Z-axis end stop input. To make use of the sensor you need to update the controller firmware with the Skynet3D updated version. 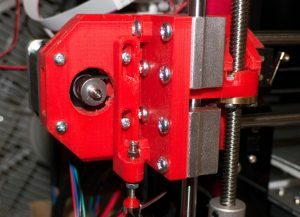 There are some E3D compatible X-axis carriages on thingiverse but they were rather complex. I went with a slightly simpler design that used my existing cooling duct. I also added a strip of 3 LEDs so I can see the tip more easily. I also fitted a better holder for the X-axis belt. There is a good design on thingiverse. 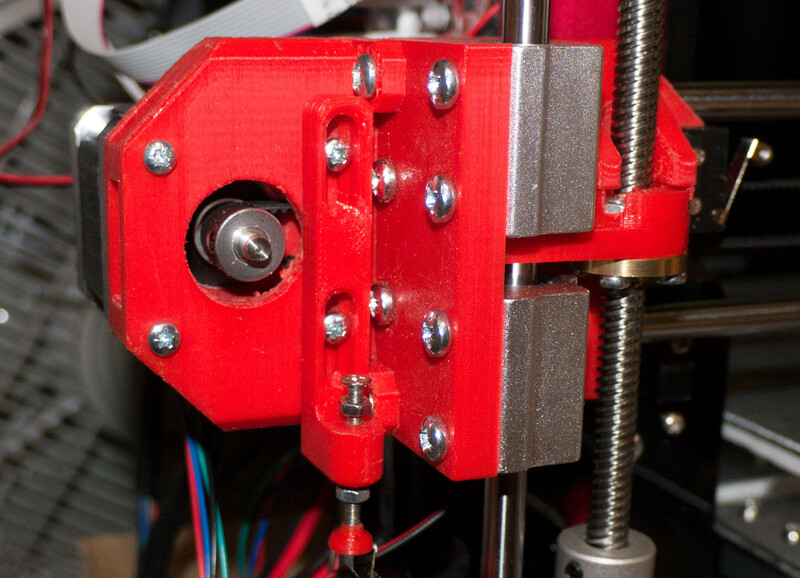 The extruder hangs off the right hand end of the X/Z assembly. It balances out the stepper on the left hand end nicely. There were two almost instant problem. The stepper on the extruder started slipping and missing steps and the hot end was blocking blocking with semi-set plastic. ARGH! Bowden feeds do have more friction simply due to the length of filament being pushed through the tube. The tube is PTFE but its still pushing a good 50cm of filament compared with the 1cm with the direct feed extruder. The easy fix was to ramp up the stepper current from about 600mA to ~1A. This involved changing R23 on the controller from 15k to 22k. Tweezers and a good soldering iron make 0805 surface mount work easy. But the downside is the stepper motor is now running HOT! 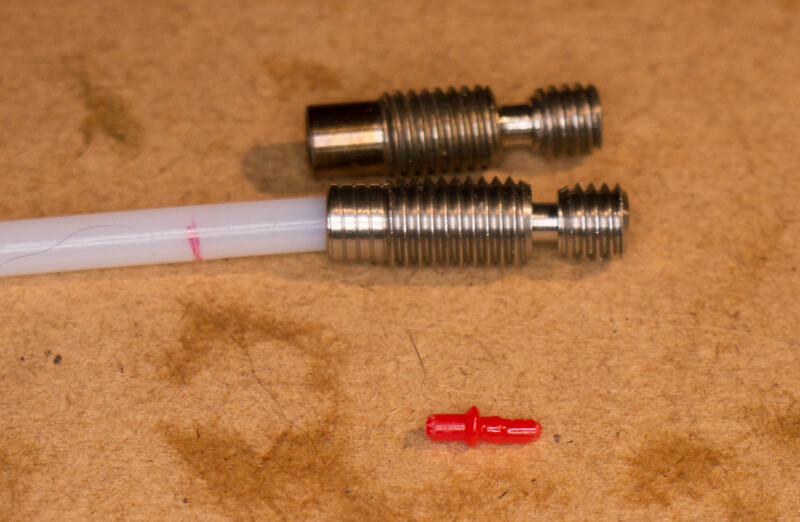 The blocking hot end was more of a mystery…. Until I compared the clone to the drawings of the real E3D v6. It turns out the clone had really fouled up the heat break. Seriously! The drawings are on the internet! The real one is on the left, the clone on the right. 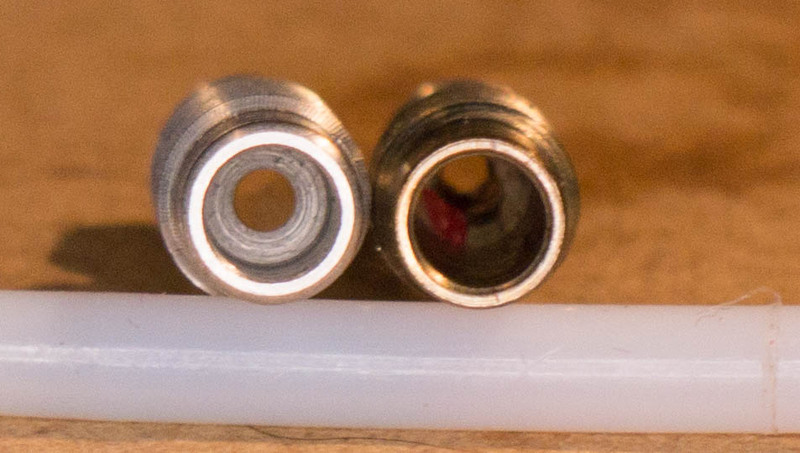 The larger diameter recess for the bowden tube was drilled about 10mm deeper in the clone meaning it ended at the hot part of the heat break rather than the cold part. The red line shows how far the bowden went into the clone heat break. And the little lump of filament shows how the semi-fluid PLA was jamming into the heat break. So after paying more for a genuine heat break than I paid for the entire hot end assembly I was back in business again. Status: Working but stepper motor getting hot.